My brother and I grew up in a rural setting in central Pennsylvania. It is located 42 nautical miles southwest of Bellefonte, which is known for its early airmail history. Several years ago we learned of the possibility of a concrete arrow in our area. Now that we are both retired from careers in aviation and are aviation history aficionados, we decided to research and hike the area. I searched the area by airplane with no success due to the dense forest canopy. 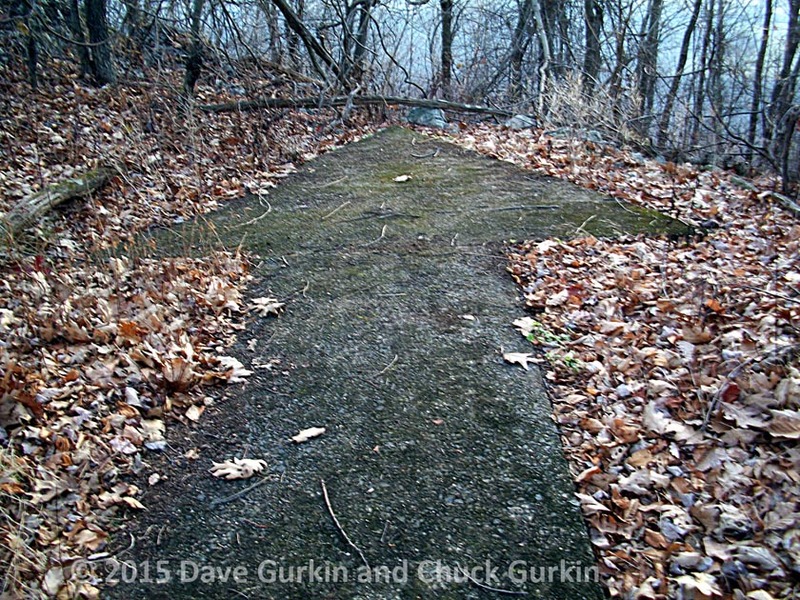 My brother and I hiked the mountain several times and eventually we discovered the concrete arrow in the early morning hours of Thanksgiving Day 2015. The terrain is steep and rocky all the way to the top of the mountain where it is situated at an elevation of approximately 2100 feet. 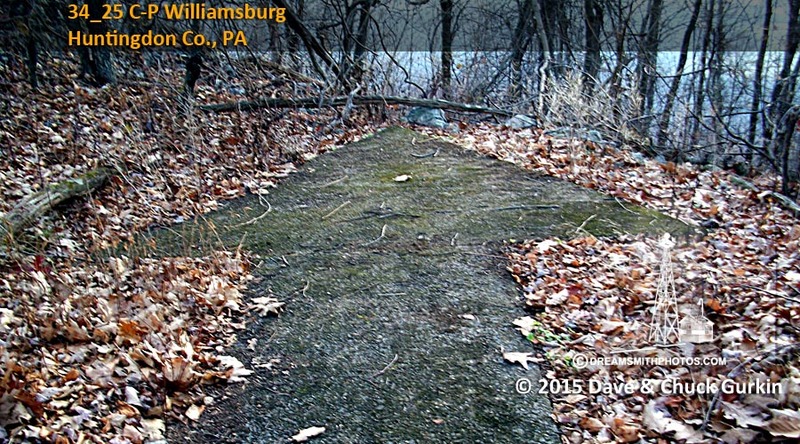 The 70 foot long concrete arrow which is 90+ years old is in excellent condition. The arrow, designated as Williamsburg #25, is on the Ebensburg to Philadelphia segment of CAM #34 which was a Los Angeles to New York airway. Cove Valley Airport (still active), was built in 1931 as an emergency landing strip for the airmail pilots. The airport is located along the route and approximately 5 miles west of the Williamsburg #25 arrow. Our next project is to determine how the building materials were transported to the mountain top since there are no access roads and the terrain is too steep for pack mules or horses. We think there may have been a tram used to get the materials to the site to construct the arrow. There are some concrete bases with attached hardware which may have been used to anchor the steel towers necessary for a tram. Also, some very senior citizens from the general area of Williamsburg #25 Arrow have talked about helping load similar materials on a tram when they were kids. The county historical society was unaware of the concrete arrow or its use. Chuck and I enlightened them one snowy afternoon. Williamsburg #25 is on private property and I want to query the land owner if they are aware of the historical significance and purpose of the arrow. Williamsburg, Pennsylvania: Department of Commerce intermediate field, site 24B, Columbus-Philadelphia Airway. Two miles W. of city. Altitude, 1,120 feet. Irregular, 60 acres, 2,870 by 1,450 feet; entire field available. Directional arrow marked "24B, C-P" Orchard on N.; trees to NE. ; beacon tower and trees on S. Beacon, boundary, approach, and obstruction lights. Beacon clear, flashing characteristic "4" (....). No servicing facilities. Described By US Geological Survey 1941 (GWL): Station is located about 3-1/2 miles SE of Williamsburg on one of the summits of a long timbered ridge. It is about 50 paces NNE of an old concrete airway marker arrow. To reach the station from the traffic light in Williamsburg, go S., on the Marklesburg road for 2.0 miles to Clover Creek Bridge. Cross bridge and keep straight ahead up steep graded dirt road for 1.0 mile to a forks. Take left fork up Woods Road for 1.3 miles to old concrete foundations. A ten-minute pack climb up steep rocky trail will reach airway marker arrow and station.